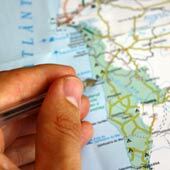 Tavira boasts a beautiful coastline of soft golden sands, calm turquoise sea waters, and pristine natural scenery. Tavira’s magnificent beaches are located along the seaward side of the Ilha de Tavira island, and this unspoilt natural scenery is protected by the Parque Natural da Ria Formosa. 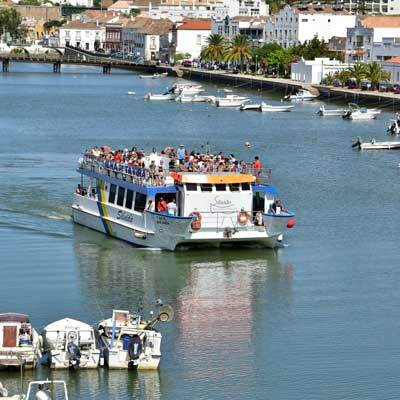 The Ilha de Tavira is separated from the mainland by the waterways and mud flats of the Ria de Formosa, and to travel to the beaches a ferry must be caught. 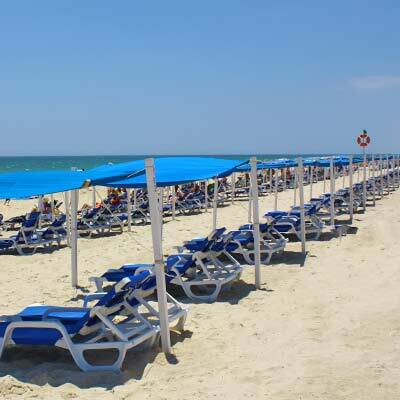 This article will provide an introduction to Tavira’s beaches, and will highlight the best beaches, along with details on how to travel to them. The Ilha de Tavira is a sandbar island that has a 10km long sandy shoreline, which stretches from Tavira in the north-east to Fuseta in the south-west. 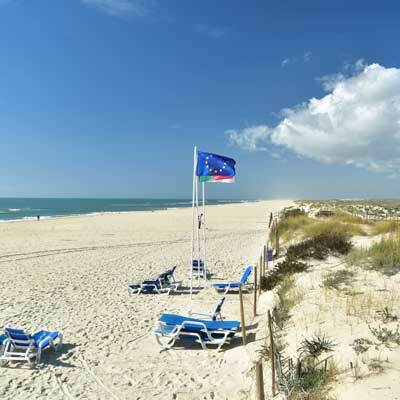 The beaches on the Ilha de Tavira are idyllic; surrounded by sand dunes and beach foliage and are without any unsightly tourist developments such as hotels or ugly apartments. 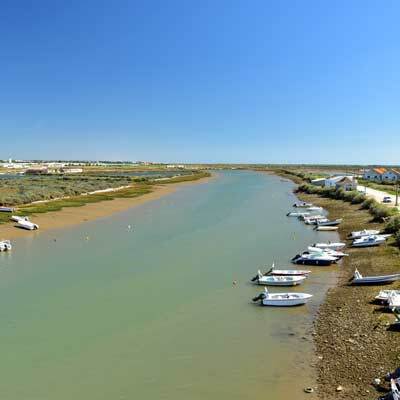 The Ilha de Tavira is only 2km from Tavira, but is separated by the Gilão River and waterways of the Ria de Formosa. There are three accesses points onto the Ilha de Tavira from the mainland (two ferry routes and one footbridge), and this gives rise to the three beaches, which are ultimately very similar. The three beaches on the Ilha de Tavira are; the Praia de Tavira (ferry from central Tavira), the Praia da Terra Estreita (ferry from village of Santa Luzia) and the Praia do Barril (footbridge from village of Pedras D’el Rei). Note: Praia do Homem Nú has no access point and must be walked from either the Praia de Tavira or the Praia da Terra Estreita. 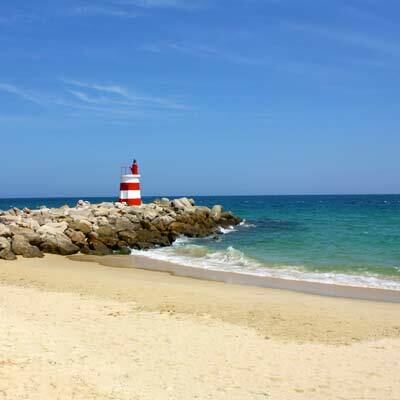 The beaches on the Ilha de Tavira are ideal for families and children. 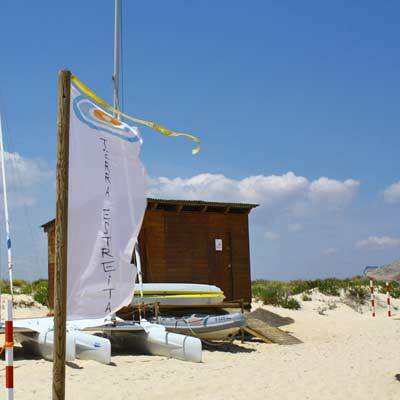 The sea waters are calm and safe, and during the summer the beaches are supervised by lifeguards. 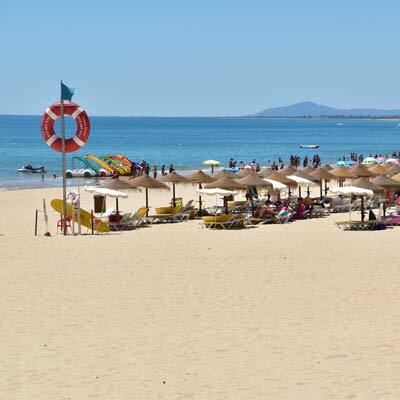 The Praia de Tavira is the best beach for families as it is the closest to Tavira and has the most facilities; toilets, cafes and beach shops. In the summer, there is a wide selection of water sports and beach activities on the Praia de Tavira, and it is a lively and enjoyable beach. There are a handful of small beaches that are within the Parque Natural da Ria Formosa, such as the Praia dos Tesos (GPS 37.118905, -7.622432). These beaches are fine for sunbathing or walking along but tend to have mud below the water level, so are not great for swimming. The Praia de Tavira is the closest beach to Tavira, being at the north-eastern edge of the Ilha de Tavira and is served by a regular ferry service from the town. 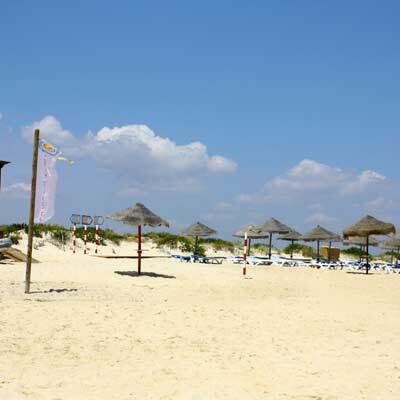 As the Praia de Tavira is the nearest beach to Tavira, it also tends to be the most popular. The Praia de Tavira is a wonderful beach, and the majority of visitors will be happy to spend most of their holiday visiting this one beach. Behind the beach, there is a summertime community which, includes a campsite, cafes and shops. 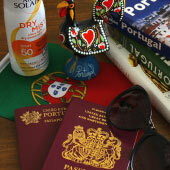 All of the facilities are low-key, but it does provide options for lunch, drinks or delicious sweet Portuguese cakes! The beach does get very busy during the summer and most beachgoers concentrate at the northern edge, close to the parasols and sunshades (€15 per day). There are quieter sections of the beach to the southwest, but be warned as the nudist beach (the Praia do Homem Nú) is around 1km away. 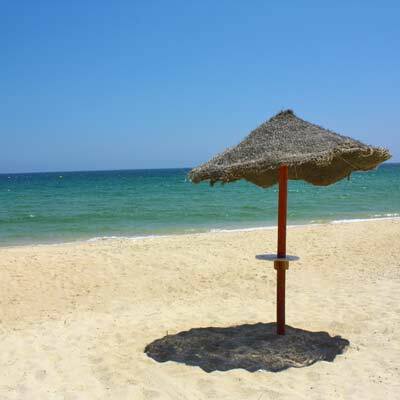 Related articles: The Praia de Tavira Beach. 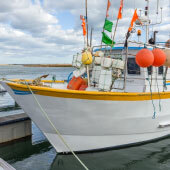 There are two ferry services that connect the mainland to the pier close to the Praia de Tavira (GPS: 37.115513, -7.621199). 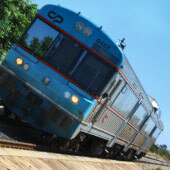 The first service departs from central Tavira (GPS 37.12496, -7.64541) and operates during the peak season (May-Sep) and costs €1.30/€2.00/€0.90 (single/return/child return). 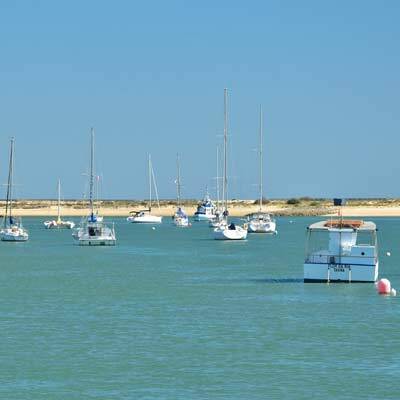 On the Ilha de Tavira, it is a 200m walk from the Cais da Ilha de Tavira ferry pier to the beach, and the route passes the campsite and beach cafes. 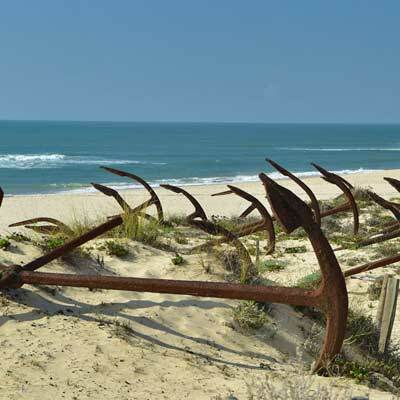 The Praia do Barril is our favourite beach of the Tavira region. Along with golden sands and clean waters, the beach provides an insight into the heritage of the region and is the setting for the Cemitério das Âncoras, a truly unique sight of the Algarve. Barril was a small fishing community that specialised in Bluefin Tuna fishing, but was abandoned in the 1960s when fish stocks were depleted. Today, the small dwellings used by the fishermen have been converted into a selection of cafes, shops and beach huts. 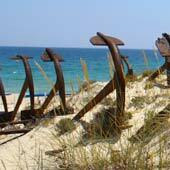 The hundreds of anchors used for the complex tuna fishing nets have been aligned in the sand dunes as a rusting memorial to this former livelihood. The Praia do Barril beach is located close to the village of Pedras de El-Rei and is the furthest of the three beaches from Tavira. At this point the Ria de Formosa waterways are at their narrowest and there is a pontoon bridge connecting the mainland to the Ilha de Tavira. After the bridge, there is a mini-train which transports visitors the 1km to the beach; this mini train was originally used to transport supplies and freshly caught fish from Barril to the mainland. 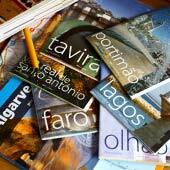 For a full guide to the Praia do Barril please click here. The Praia da Terra Estreita Beach is virtually undiscovered by tourism and is one of the quietest beaches of the Algarve. The beach is located on the middle section of the Ilha de Tavira, approximately 2km from the Praia de Tavira and the Praia do Barril. 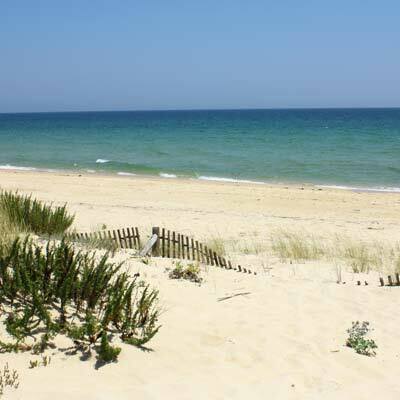 The beach lies in front of the small fishing town of Santa Luiza and there is a direct ferry from the town. On the beach, there is just a single beach bar/café while to either side of the beach are deserted stretches of coastline. 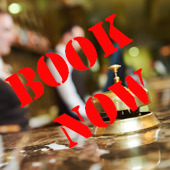 There is no direct ferry from Tavira and the only connection is from the small fishing town of Santa Luzia, 3 km to the east of Tavira. During the summer the ferry departs every 15 minutes and the return trip costs €2.00. The Praia da Terra Estreita is the beach to visit to escape the crowds and the quiet and relaxed ambience makes the beach a favourite of all who make the effort to travel here. The Praia do Homem Nú was the Algarve’s original nudist beach but is not very popular as it is so difficult to get to. 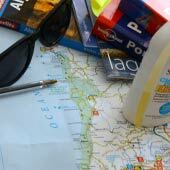 The only method is to travel to the Praia de Tavira or the Praia da Terra Estreita and then walk the 1km along the beach. The sea waters of the Tavira coastline are crystal clear but are surprisingly chilly, even at the height of the summer. During the peak season (June-August) the sea temperature is 21-22C but this drops to 16-17C in the winter (December – February). The sea water temperatures are cooler than the Mediterranean Sea as they are fed by the Atlantic Ocean. If you are planning to spend an extended period in the sea consider using a wetsuit.